With sections titled Who You Are Right Now, Loving and Being Loved, and Guided Drift, Fred addresses the scope of human transitions. It all comes down to knowing we're valuable, and that we're worthy of that value. As Fred would say, "You don't have to be anything more than who you are right now." In her Foreward, Joanne Rogers shares the Fred she knew. With stories from their life together, the joys as well as the struggles, Joanne shows how Fred looked at life as a journey--with the ups and downs and in-betweens. Known as "America's favorite neighbor," Fred Rogers dedicated his life to serving children through public television as creator, composer, writer, puppeteer, and host of Mister Rogers' Neighborhood. He studied at the University of Pittsburgh Graduate School of Child Development and was ordained a Presbyterian minister, with the unique charge of working with children and families through television. Fred Rogers' relentless commitment to all that is best in people led to an astonishing array of honors, from induction into the Television Hall of Fame to the Presidential Medal of Freedom. 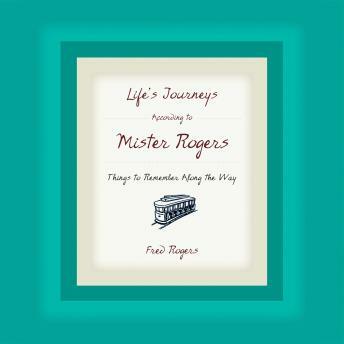 Fred Rogers passed away in February 2003. Family Communications, Inc. (FCI), founded by the late Fred Rogers in 1971 to produce Mister Rogers' Neighborhood and related projects, continues to expand its reach through early childhood trainings, publishing, and new technologies--perpetuating the values and philosophy of its founder.